By now, you’ve probably heard of Alexa. If you haven’t, don’t worry. You will. Because Alexa – Amazon’s voice-powered, intelligent personal assistant – is becoming increasingly more popular and increasingly more capable by the day. Through the Amazon Echo and it’s Dot, Tap and Show devices, Alexa gets into people’s homes and lives, allowing Amazon to better understand their customer’s needs, wants and interests and then pair with third-party platforms who can help accommodate to these. Between Amazon and the wise third-parties who’ve hopped on board the Alexa train, nearly anything and everything you might want or need seems suddenly and instantly possible. So if you thought that smartphones, apps and online shopping were the height of convenience, you might want to think again. And while Alexa does make life even more seamless, she also makes life more…well, fun. There are so many questions and requests you can ask of Alexa – both practical and bizarre – and we’ve come up with some of the coolest, weirdest, and most helpful features Alexa devices have to offer. So check them out. And don’t be shy. Alexa always has an answer…or a at least a horn to blow. Earlier this year, Amazon introduced Alexa calling and messaging. 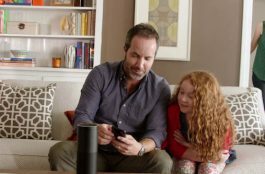 This feature allows customers to make and receive calls and messages to family and friends who also use Amazon Echo products or the Alexa app for iOS. All you have to do is ask by saying “Alexa, call [insert name]”, or “Alexa, send message to [insert name]”. What’s cool about this is that making calls and sending messages doesn’t eat up your plan’s minutes. Since this feature uses Wifi – much like Facetime and iMessage – these calls and messages are free to make (well, you still have to pay your internet bill but you get the idea). Alexa transcribes your messages and can even read them aloud to the recipient. And what’s more: the new Amazon Echo Show works just like the Echo only it has a 7-inch screen for video calling. So, if you’ve left your phone in the car or upstairs and don’t have the energy or time to go retrieve it, that’s fine. Stay where you are and simply ask Alexa to make a call or send a message for you. As we said, Amazon Alexa products aren’t only about convenience. They’re also about fun. With Alexa, you can immerse yourself in interactive audio adventure games, like the Wayne Investigation Game. This adventure – brought to fruition by a partnership between Amazon, DC Comics and Warner Bros – turns you into the lead investigator on the mysterious case of the death of Batman’s parents. The game guides you through Gotham City, where you interview various characters, find clues, and (potentially) solve a matter near and dear to Batman’s heart. Who’s the hero now? If you’re both a DriveNow and Amazon Alexa customer, getting around is more seamless than ever before. Open the DriveNow skill by simply saying “Alexa, open DriveNow”. From there, you can ask which types of cars are closest to you and receive an answer within seconds. You can then instantly reserve the car of your choice without ever having to pick up your smartphone device. The idea here, DriveNow’s co-managing director Sebastian Hofelich says, is to “connect smart living with modern mobility.” And that they did. Likewise, you can also use Alexa to schedule Uber and/or Lyft rides straight to your home without having to use anything but your voice. This is a particularly good tip for those who live fast-paced, on-the-go lives. If you’re listening to music, or the news, or a podcast on your Amazon Alexa but you need to leave the house you can command Alexa to switch over to your other portable devices by saying “Alex, send that to my Fire”. Alexa will instantly switch what you’re listening to your preferred device so you can be on your way but not miss a beat. The British Red Cross has partnered with Amazon to help customers should they ever find themselves in an emergency situation. First, ask Alexa to “open First aid”. Then, ask Alexa to help you with what you specifically need in your particular situation. Alexa can then give advice for anything from burns to CPR to how to treat someone having a seizure. This feature has recently saved a life, which made headlines all over the world. Of course, though, call the police for emergency situations first! With the Alexa-friendly Translated app, you can now ask Alexa to translate any sentence for you into over 36 different languages! First, command Alexa to “open Translated” then simply tell her what to translate. For example, you could say “Alexa, say ‘how is your day?’ in French”. Alexa will then actually say this to you in French. So impress your friends when they come over by welcoming them in in Spanish or German or Italian – but don’t forget to thank Alexa for her help!